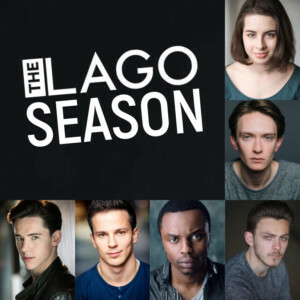 The LAGO season consists of a trilogy of plays written BY the Director of LAGO Theatre Jack West: Revelation 1:18, directed by Jack, No Help Sent, directed by Scott Le Crass and Wine, directed by Harry Blumenau. Revelation 1:18 is about a music band (Joshua Glenister, Oliver Buckner, Rob Hadden) who has just started to climb the charts. But is this enough to leave a legacy? Or would the world need something else to remember them? No Help Sent: The NHS has been privatised, their best friend (Oliver Buckner) has cancer and there are no more options. What some friends (Peter Lofsgaard, Joshua Glenister, Rob Hadden) will be able to do to help him? That is the question asked by the play. Wine is about Sam and Mark (Harriet Clarke and Tobi Falade), who meet again one year after they broke up. It is supposed to be a romantic night, but ghosts from the past start hunting the couple again and the hard truth emerges minute after minute. Will some wine be able to cancel the real reason why Mark and Sam broke up and to give them a second chance? Jack West knows how to talk about contemporary hot issues – male suicide, privatisation of the NHS and abortion – in an accessible way, blending universal topics – friendship, love, death, relationship, fame, masculinity, loss – with the right dose of comedy and intense drama. He is indeed a gifted writer. All the three plays gradually reveal the story and end with “raw emotions”, especially Revelation 1:18 and Wine, while No help sent, despite the serious matters (cancer and public health) is more on the comic side: the real topics addressed and the desperate condition in which the characters verse are not fully explored (it would have been nicer to have more incisive dialogues and to hear more reflections from the Doctor). Great and authentic acting from all the six actors, who have also the merit to make credible the at times grotesque situations described. This thought provoking material is well put together, with top-class acting and stories that go straight to your heart and punch your stomach. Fringe at its best.